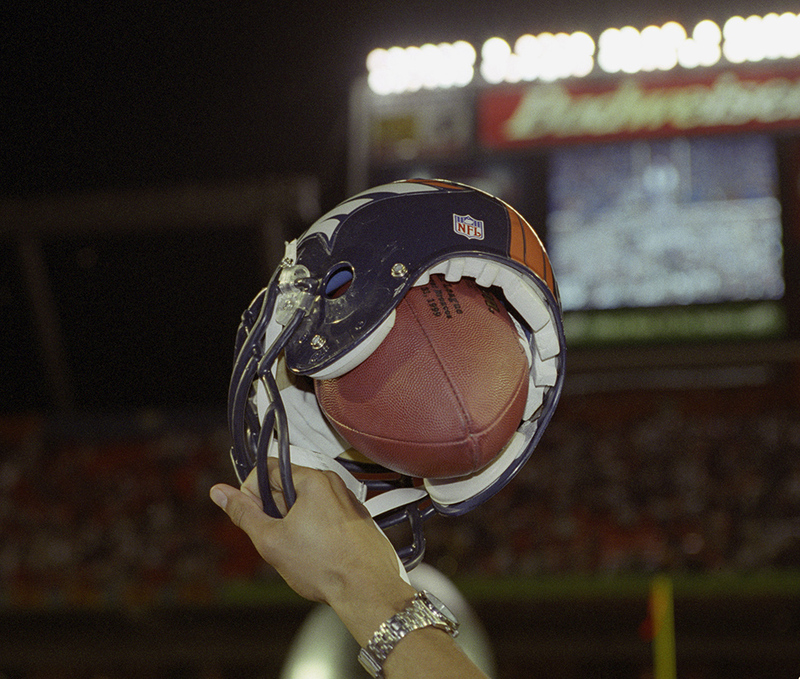 A Denver Broncos helmet is held in the air in triumph following the Broncos 34-19 victory over the Atlanta Falcons in Super Bowl XXXIII on January 31, 1999 at Pro Player Stadium in Miami, Florida. Denver defeats Atlanta 34-19 in Super Bowl XXXIII at Pro Player Stadium in Miami, Fla., to claim its second consecutive World Championship. Denver becomes just the sixth franchise in league history to win back-to-back Super Bowls, joining Green Bay (Super Bowls I and II), Miami (VII and VIII), Pittsburgh (IX and X; XIII and XIV), San Francisco (XXIII and XXIV) and Dallas (XXVII and XXVIII). John Elway is named Most Valuable Player of Super Bowl XXXIII, passing for 336 yards and a touchdown, and rushing for another score. Terrell Davis (102 yds.) sets an NFL record by rushing for 100 yards in his seventh consecutive postseason contest, and fullback Howard Griffith rushes for two touchdowns. Rod Smith’s 80-yard touchdown reception from Elway stands as the second-longest play from scrimmage in Super Bowl history and defensive tackle Mike Lodish sets an NFL record by playing in his sixth Super Bowl (4 with Buffalo, 2 with Denver). Cornerback Darrien Gordon’s 108 yards on two interception returns establish a Super Bowl record and also make him the Super Bowl career leader for interception-return yards.